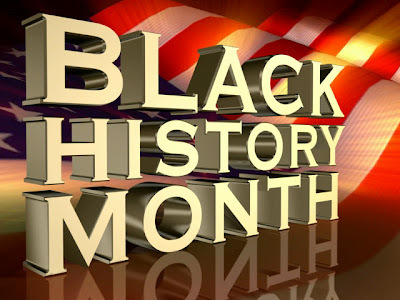 Figgured I'd write about black history month, since it's almost over. I don't think I've ever written about it before, but like most things, I do have an opinion on it. In a nutshell, I'm not really a fan. I mean, if it's the only option--I'll take it. And I certainly appreciate the sentiment behind it. I'm assuming that the person who thought it up was black, and I can get behind the idea that the accomplishments of black people need to be acknowledged and celebrated. However, the problem with having a special month is that it accepts the idea that we can focus on black people (or Asian people, or women, et al.) during a certain time of the year, and not give them our attention during the 11 other months on the calender. A similar problem exists with the thinking behind departments like African-American studies. By segregating these works into their own disciplines, universities are basically saying, "Hey, if you want to learn about these non-white, non-male, non-straight people, come over here and take this special class." And guess what? Most people don't. Let me share an example from my own life: as it says over in that sidebar, my focus in graduate school was multicultural counseling. Basically this meant that in addition to the coursework that was required for all students, I had to take a few extra classes that focused on various aspects of identity. Contrast this experience with another class: Religion and Spirituality in Counseling. Again, this was a class that was an elective for most everyone in the program. The name is pretty self-explanatory. For some reason, this class was packed with people--so many people were interested that there was a waiting list. I remember on the first day being like, "WTF? Why are there so many people in this class? These people don't need this class to graduate!" In my view, the short answer is that they were in the religion class because they were interested in the topic, and they weren't in my other class because they weren't interested in the other topic. Hey, people are allowed to have preferences. And I am allowed to believe that this thinking is detrimental to clients, especially when so many people that use public mental health clinics (a popular starting point for recently graduated counselors,) are people of color. Similarly, if you have a class called Women in Literature, that has a bunch of great works by women authors, it allows the class called simply British Literature to highlight only dudes, with maybe one woman thrown in as a token gesture. I've got a better idea: Instead of ghettoizing certain disciplines, why not incorporate them more fully into the learning process? Get rid of the bottom tier of white male material, and replace it with the top tier of material from authors of different backgrounds. Then the class is not dominated by one group of people. And if students want to learn more about that particular subject, they can take another class which has the not as good works, again, from people of a variety of backgrounds. And instead of just airing shows like Savoring Harlem in February, "in honor of black history month," show them year round. As I have said before on this blog, one of the major problems is that white people get the message that they are the center of the universe, the gold standard by which all other people should be judged. We have got to shift the focus to one that acknowledges the contributions of all of us, and not just during a certain time of the year. So, what do you think? Feel free to leave me a comment. Hi, people. I can't sleep. And you know what they say, "It's better to get out of bed and be productive, than stay in bed doing nothing." And by "they," I mean me. One of my Facebook friends posted this video on her wall. I really liked it, so I thought I'd post it here. Even though it's Monday, it's not a song. It's a spoken word piece called Duality Duel . It's not too long, and there is some NSFW language. Though, if you have the luxury of getting paid while you read blogs/watch youtube videos, I hope you consider yourself lucky. Some people work 16 hour shifts with no break putting iphones together. I like this piece for a number of reasons. I think the biggest one is that it has the message that we need to get in touch with all sides of ourselves in order to help others. When we go through the world presenting a perfect picture of what our lives are like, it only serves to separate and isolate us. But the reality is that none of us have pretty little lives. There is a lot of suffering in the world, and we have all experienced it in one way or another. One way that we can help to heal our own suffering is to share it. We can also reach out to help others, despite our own suffering. These things will help us all to heal. One of my favorite psychotherapists is Carl Rogers. He has a quote that says, "What is most personal, is most universal." This piece is a good example of that sentiment. I hope that both the quote and the poem inspire you to be true to yourself and to connect with others, because we need a lot more of both of these things happening in the world.